The drill will reportedly consist of 19 surface ships,1 submarine and 3 fixed-wing aircraft. The Chinese and Russian will hold their largest-ever joint naval exercise from July 5-12 in the Sea of Japan, a Chinese official announced on July 1. Fang Fenghui, Chief of the General Staff of the Chinese People’s Liberation Army (PLA), said that “Joint Sea 2013/Naval Interaction 2013” made the announcement during a visit to Moscow. The following day, the Ministry of Defense in Beijing said that four destroyers, two missile frigates and a support ship, would participate in the exercise, which will be conducted in the Bay of Peter the Great. The vessels left the port of Qingdao on June 28. Fang said the exercises did not target any third party and were meant to strengthen cooperation between the two armed forces and to enhance their capability in coordinating military operations to help safeguard regional security and stability. The exercises are also part of ongoing efforts by the PLA Navy to familiarize its naval officers with operations away from China’s traditional theater of operations. Zhang Junshe, deputy director of China’s Naval Military Studies Research Institute, told Chinese media that a total of 19 surface ships of various types — seven from China and 12 from Russia — will take part in the exercise, along with one submarine, three fixed-wing aircraft, helicopters, and special warfare units. According to Zhang, this will also be the first time that a Russian Sukhoi Su-24M Fencer bomber take part in joint exercises with China. Based on various pictures posted on the Internet, the PLA Navy vessels involved in Joint Sea-2013 are the Type 052C (Luyang II class) Lanzhou (170); Type 052B (Guangzhou class) Wuhan (169); the Type 051C (Luzhou class) Shenyang (115) and Shijiazhuang (116); the Type 054A (Jiangkai II class) Yancheng (546) and Yantai (538) and the Hongze Lake comprehensive supply ship (881). At least three ship-based helicopters will take part in the exercise. During the July 1 meeting, Fang and his Russian counterpart, Army General Valery Gerasimov, also confirmed the dates for Peace Mission 2013, a joint Sino-Russian anti-terrorism exercise, which will be held in Chelyabinsk, in Russia’s Urals region, from July 27 to August 15. The first Peace Mission exercise was held in 2005. Interestingly, the PLA Navy will also participate in the U.S.-led multinational Rim of the Pacific (RIMPAC) exercise next year. However, from discussions with various defense officials in the region, there seems to be little agreement among traditional allies as to the role — which is likely to be limited and “less sensitive” — that the Chinese Navy is to be given during the exercises. Some analysts have pointed to the risks that the PLAN could collect useful intelligence through its participation in RIMPAC at a time when it is becoming increasingly belligerent towards its neighbors. The U.S. risks making a serious strategic error if it neglects Russia. 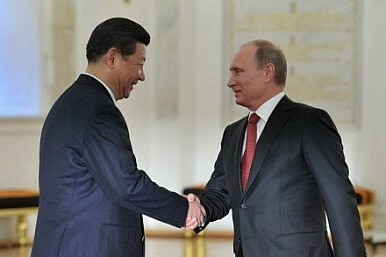 As the White House and Pentagon look to the Pacific, Moscow and China are making moves of their own.